An athlete becomes a movie star; a waiter rises to manage a chain of nightclubs; a movie scenarist takes to writing restaurant reviews. Intrepid women hunt bears, drive in automobile races, and fly, first in balloons and then in airplanes. Sensational crimes jump from city streets onto the screen almost before the pistols have had a chance to cool. Paris in the Twenties? Fitzgerald's New York? Early Hollywood? No, tsarist Russia in the last decades before the Revolution. In Russia at Play, Louise McReynolds recreates a vibrant, rapidly changing culture in rich detail. Her account encompasses the "legitimate" stage, vaudeville, nightclubs, restaurants, sports, tourism, and the silent movie industry. McReynolds reveals a pluralist and dynamic society, and shows how the new icons of mass culture affected the subsequent gendering of identities. The rapid industrialization and urbanization of the late tsarist period spawned dramatic social changes-an urban middle class and a voracious consumer culture demanded new forms of entertainment. The result was the rapid incursion of commercial values into the arts and the athletic field and unprecedented degrees of social interaction in the new nightclubs, vaudeville houses, and cheap movie houses. Traditional rules of social conduct shifted to greater self-fulfillment and self-expression, values associated with the individualism and consumerism of liberal capitalism. Leisure-time activities, McReynolds finds, allowed Russians who partook of them to recreate themselves, to develop a modern identity that allowed for different senses of the self depending on the circumstances. The society that spawned these impulses would disappear in Russia for decades under the combined blows of revolution, civil war, and collectivization, but questions of personal identity are again high on the agenda as Russia makes the transition from a collectivist society to one in which the dominant ethos remains undefined. "First and foremost it is a recovery of little-known stories of Russian leisure activities, an effort to 'resurrect' what has largely 'vanished' from historical memory.... This recovery of the past is often quite celebratory (the author's pleasure in discovering and telling these tales of Russians 'at play' is apparent), yet this appreciation has interpretive weight. Louise McReynolds argues, against the well-known contempt for commercial entertainment by contemporary culturalist intellectuals, that Russia's growing commercial mass culture offered citizens facing a rapidly changing modern society much of value. Above all, it offered Russians opportunities to orient themselves as individuals and social beings, to fashion and adapt new identities, and to find refuge." 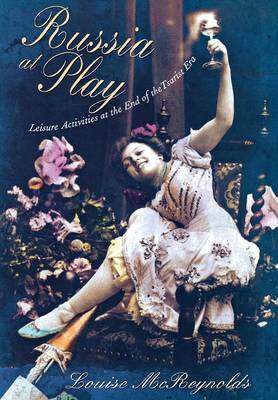 "In her well-researched and stimulating book, Louise McReynolds brings firmly to our attention the late tsarist leisure industry and show show it can deepen our understanding of Russian culture and society.... The book also has more than fifty well-chosen illustrations: street scenes, sports photos, photo-portraits (especially of actors), cartoons, and promotional pictures of resorts." "Louise McReynolds continues to amaze with her boundless curiosity and sparkling comparative and theoretical insights. Russia at Play buzzes with energy and comes to life in vivid pictorial scenes full of well-rounded human beings. It explores not the dark recesses of an unknown past, but the lighter side of life-hunting, combat sports, performance art, movies-in a long-needed re-creation of cultural and social practices among all classes in pre-revolutionary Russia. Readers will derive as much pleasure from this book as the author obviously did from writing it." "Louise McReynolds has given us a book on pre-Revolutionary Russian entertainment that is massively and inventively researched, clearly written, theoretically sophisticated, deeply comparative and, yes, entertaining. Setting her work in a modern, urban, and capitalist Russia, McReynolds presents a no-longer-missing middle class, engaged not with high culture and nation-saving but rather with sports, tourism, restaurants, movies, and cabaret life. She gives new meaning to the term 'party politics.'." "Louise McReynolds's book provides a vivid picture of a new side of pre-Revolutionary Russia: a dynamic and diverse mass culture of theater, film, night life, and restaurants that expressed the dreams and social identity of Russia's emerging middle-class." "McReynolds (Univ. of Hawaii)... has here turned her considerable talents to an investigation of pre-Revolutionary Russia's 'leisure time' activities.... In arguing that vibrant commercial values had penetrated an emerging sport, dramatic, nightclub, and cheap movie house culture, McReynolds again, as she has so often in the past, sheds new light on a neglected but important facet of Imperial Russian history. Summing up: Highly Recommended. Advanced undergraduates and graduate students." "Russia at Play is full of interesting information for students of culture of both the Imperial and the Soviet period, and it makes an important contribution to the discussion of Russian identity.... This thorough study of leisure makes a fascinating addition to our understanding of politics, gender, and daily life in the late Imperial period while simultaneously indicating many areas warranting increased research."